Would you like to work as pastry chef or baker? Bakers often start their work in the early morning, measuring and mixing ingredients to make breads, cakes, cookies, and other delicious baked goods. These professionals must think critically and possess clear communication and business ethics in addition to menu and dessert preparation qualifications and food service skills. These skills apply to a variety of culinary positions and transfer well to related industries such as catering and hospitality. Some professionals remain dedicated bakers and pastry chefs, while others branch out into restaurant or event management as caterers and planners. In addition to exhibiting dedication and passion for cooking and the art of baking, those interested in pursuing this career should receive formal training. This industry contains tough competition, so it is extremely important to receive all the training necessary to help promote your knowledge and skill sets to employers. For professionals who already have a bachelor's degree or seeking to change careers, an associate degree program may be the best option to complement their current skills. Job seekers can find career training through vocational schools, distance learning programs, and professional culinary associations. Baking and pastry students typically receive an amazingly well rounded education to help prepare them for the challenges of this demanding industry within two years. Many accredited programs also offer internships and externships that enable students to obtain hands-on experiences while working in actual kitchens. Baking and pastry associate's degree programs provide students with extensive hands-on classes in baking and pastry and curriculum fundamentals. Students learn basic baking principles and pastry preparation for cakes, breads, cookies, frozen desserts, and other baked goods. They must master the art of creating desserts that look as good as they do taste and vice versa. Students learn how to prepare dough for breads and baked goods and make icings and fillings for different cakes and pastries. Programs also cover recipe development, candy creation, culinary skills, and centerpiece preparation and presentation. Students acquire skills in food presentation, food safety, sanitation procedures, hospitality, and management. Many baking and pastry degree programs also offer courses in culinary desserts, cake and pastry decorating, baking industry operations, purchasing and properly storing necessary ingredients, and counter display and customer service. Coursework may also include ingredients, nutrition, food science, applied chemistry, private and government sanitation regulations, product packaging and marketing, and business concepts and entrepreneurship. Some programs require students to complete extra projects, such as developing a retail bakery business plan. In addition, internships at bakeries and similar environments enable students to practice learned skills. Students can then practice using a variety of tools and equipment to produce breads, cakes, frozen desserts, cookies, centerpieces, candies, and various pastries. Such programs enable students to learn firsthand the necessities for running a successful operation. Many graduates can then obtain entry-level professional baker, pastry chef, or cook positions in restaurants, cafeterias, bakeries, and other commercial establishments. Seasoned bakers sometimes start businesses of their own and cater corporate events, weddings, and other momentous occasions. When you enroll in an associate’s degree program every school will have a different curriculum so make sure to get a detailed list of all of your courses before you start. Some schools allow you to swap out courses depending on your focus. Some schools offer nights and weekends cooking courses and you’ll need your GED or high school diploma to enroll. Breads - Learn all about grains and artisan breads. Understanding the entire baking process and how breads play a role in food pairings. Also receive training on oils and spreads. Food Nutrition - Learn about the nutrition side of cooking and how to calculate calories and the nutritional values of the foods you cook. This is becoming more important as customers sometimes need to know calorie count for diets, especially if you are personalizing a food plan for a client. Business – Learn about the business side of the baking and pastry business. You’ll calculate menu and food costs, understand payroll and accounting and even how to successfully run a restaurant. Baking – Understand baking concepts and ingredients. Learn how to measure both dry and liquid ingredients. Food Safety – Understand about food safety including proper storage, cooking temperature as well as food selection and cleaning. Get familiar with kitchen safety including the proper way to handle knives and other kitchen equipment. One of the great things about this career is all of the career options available to you after graduation. Most schools have you take an externship before you graduate with your Associate’s degree. This cooking externship will allow you to show off your baking and pastry skills that you learned in school to a potential employer. A lot of the times that employer will hire you even before you graduate. Below are some of the top baking and pastry careers you’ll qualify for once you receive your Associate’s degree. Pastry Chef – As a pastry chef or assistant pastry chef you’ll be responsible for creating all the baked and pastry goods at the restaurant. Some of the larger establishments might hire individuals to just handle a certain aspect of the menu. Baker – As a baker you can work directly in bread shops or even shops that handle specific deserts. Restaurant Chef – You’ll have the cooking experience to get an entry level position as a restaurant chef. It is however recommended that you earn a more advanced degree in culinary arts to become a head chef and get properly trained. Cake Decorator/Owner – Becoming a cake decorator or even owning your own cake or cupcake shop is a possibility once you get the experience. We recommend take some business courses such as marketing and accounting if you wish to open up your own shop. Chocalatier – Specialty chocolate shops hire individuals that deal mainly in sweets. 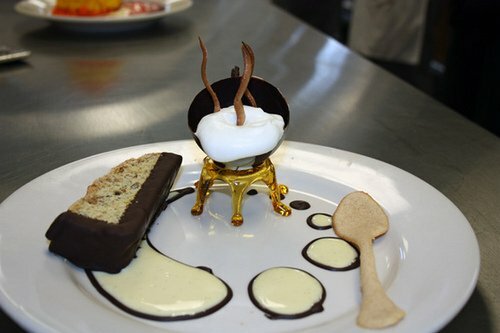 Creating chocolate treats is an art and a great challenging career. As mentioned above most of your externships will be a chance for you to show a possible employer what you learned at school as well as a way for them to evaluate you for your final grade. Below are the top 5 places most graduates find employment after graduation. Hotels – Almost every hotel has either a restaurant attached or their own in-house food service. These properties are always hiring for chefs and cooks. Many hotels also host conventions where planned meals will need to be prepared in a much larger scale. Restaurants – One of the more entry level positions will simply be to get hired in a restaurant as a cook. This will give you the years of experience needed to work your way up to other higher end restaurants. Do not overlook these opportunities when you first graduate. Bakeries – Often bakeries have now turned into more specialized shops serving pastry dishes and even coffee. Your experience during your Associate’s degree will have trained you well enough to get a job in a bakery. Resorts – One area of the industry that is constantly growing is the need for qualified chefs at high end resorts. Resorts in Las Vegas for example employee 100’s in their kitchens to prepare food for 100’s of thousands of guests daily that pass their resorts. Large hotels have teams of bakers and pastry chefs that just handle all of the deserts that go out. If you live close or want a good career then we recommend contacting these resorts first as the vast amount of openings is attractive to any new chef. As a new baker or pastry chef expect to put in longer hours with moderate pay increases for the first few years of your career. You’ll need to gain experience and the entry level salary is approx. $26,500 nationwide however larger salaries are see on the coastal states where you can expect to make closer to $30,000. Once you gain experience the top 10% of all bakers and pastry chefs make $55,000-72,000 per year. The industry is expected to increase 5-6% over the next 10 years.